Tears welled up in my eyes as I listened over dinner to three people talk about a seven-story office building destroyed by the large earthquake that rumbled through Mexico City last year. The building, Alvaro Obregón 286, was the worst collapse in the city, taking 49 lives. The rescue workers sharing our table also were moved to tears as the survivors shared their experiences. One minute their friends and coworkers were all around them and the next the building collapsed, burying them all in the rubble. 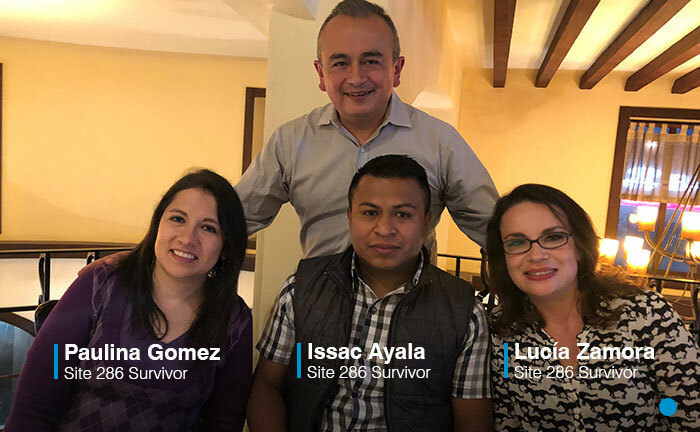 They spoke about how the voices and breathing of the people trapped and injured were fading out, until only three of them were left alive; about how they shared positive words to support each other for the 35 hours before they were rescued. In the photograph here, you see them: Paulina Gomez, Isaac Ayala and Lucía Zamora. Paulina Gomez, a psychologist, lost 38 young coworkers, many of them around her. On the floor she worked on, only she survived. Today she is trying to recover her ankle movement after an exposed fracture of her leg. Isaac Ayala, a construction worker, talked about a woman who worked on the same floor whom he helped to the emergency staircase during the shaking. After the building collapsed, she held his foot and asked him to help her. As the minutes passed, her grip relaxed and he understood that she had died. Isaac was not injured and returned to his job remodeling offices and homes. Lucía Zamora, a marketing consultant, was next to Isaac in the collapse. She now lives in Spain, studying literature. Having written down her story, she shares her experience with victims’ families for her own resiliency and to lessen their pain. She was the last survivor pulled from the rubble at 36 hours. The three of them survived 35+ hours in a space of 40 cm (about 1.5 feet) between two concrete slabs of the third and fourth floors. They thanked us for our help and for giving them “a second chance in the life” and asked us to please continue preparing for this kind of emergency. To me, an engineer, they asked me to work hard to avoid more tragedies of collapsing buildings. They now know there are thousands of buildings like AO-286 and would like to know that more people won’t die like their friends and colleagues did. I released my last teardrop—not of sadness, but pride.